What an awesome group! 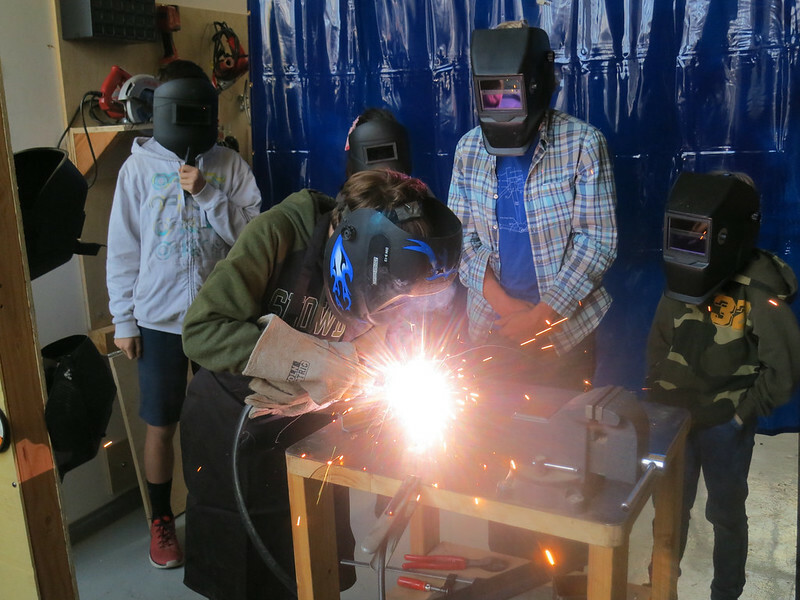 It was our last one day welding workshop of the season, and this group really put their all into making some amazing projects. Lucy does her first weld all on her own, even though she was really nervous! We started the day off learning how welding works, how we work the welding, and how to be safe! We all agreed to share welding techniques, design ideas and mistakes we overcame with each other all day. Then everyone got to practice welding on a flat piece of metal to get the hang of it, before we started joining pieces together! 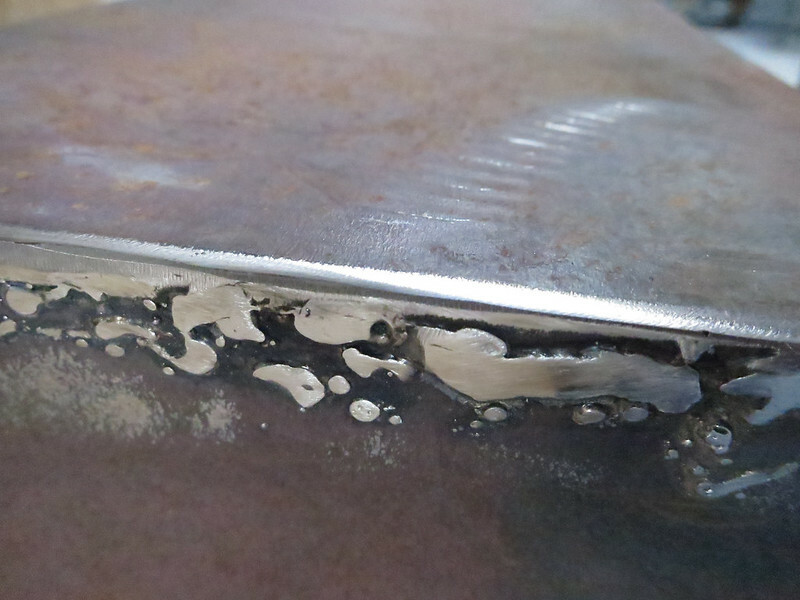 Here we see a weld with zigzags that are too far apart, one that was too fast, and one that was fast then slow! 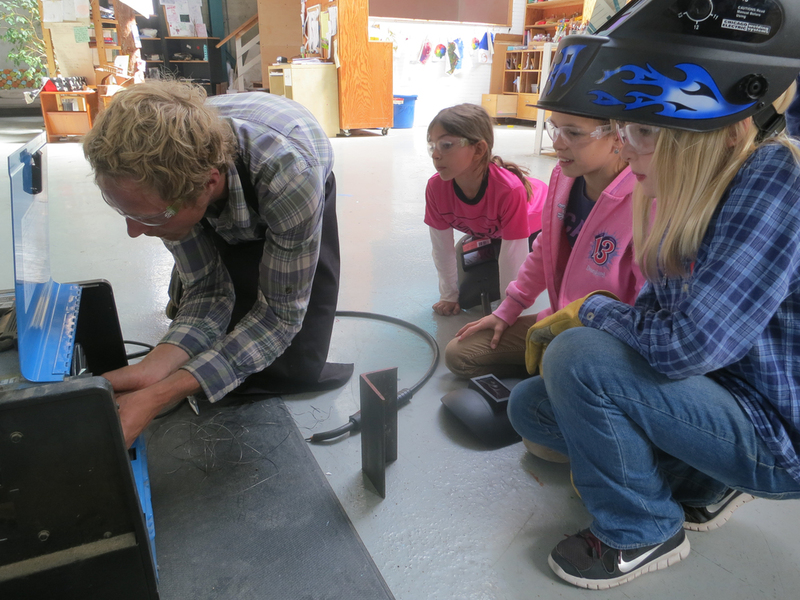 After kids had a good idea of to use the welder, they brainstormed and designed, then re-designed then got to welding! Welding is 90% set up and 10% welding. Here are some cool set-ups the kids did today. 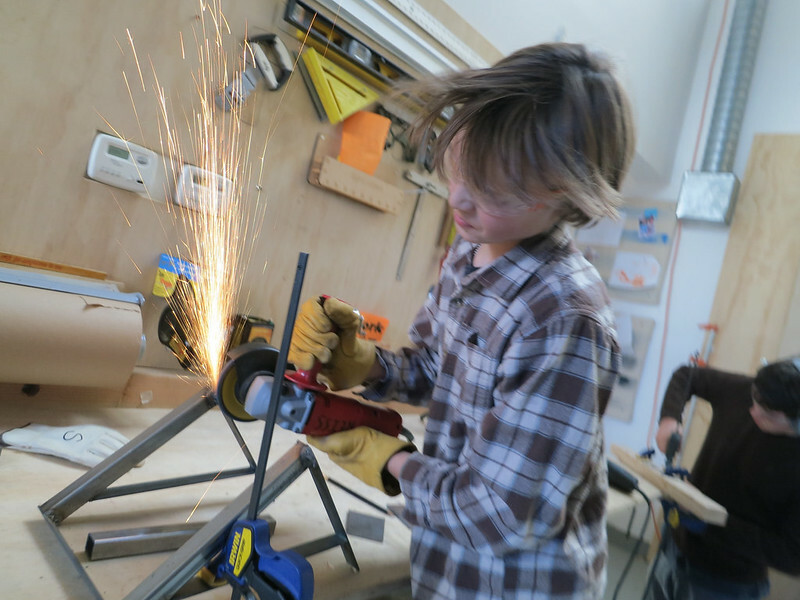 Some projects needed curved pieces, so we heated them up with blowtorches and bent it with giant wrenches! This workshop was a great mixed age group of kids! They collaborated through out the day, even though they were all working on independent projects. They made sure their fellow tinkerers were getting equal welding time and helped each other figure out problems. Then they all helped reset the tools and stations when we were all finished! What a dream! 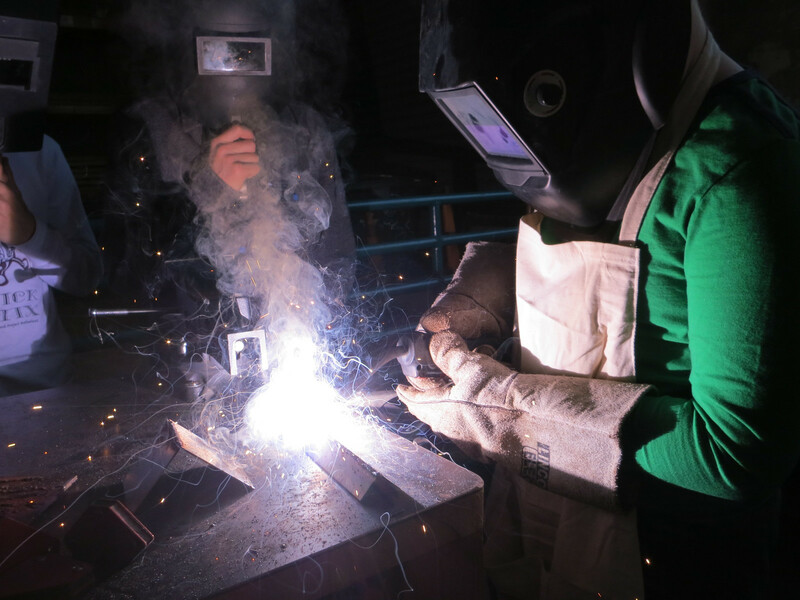 Welding is a skill that really takes practice and time, so it's always amazing to see tinkerers dive in headfirst with no prior training. We begin by going over our Tinkering School goals and welding group agreements before jumping right in to a technical demonstration with Amanda. 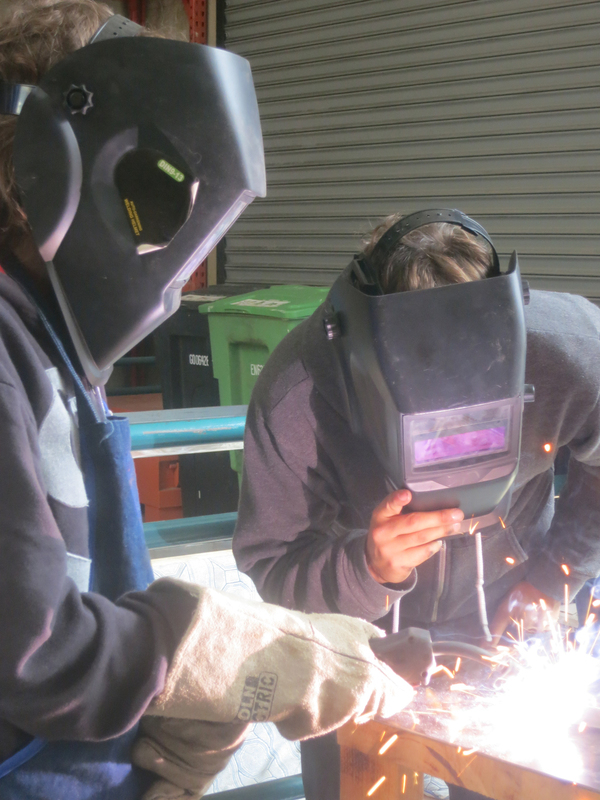 After watching how it's done, the tinkerers take turns welding two pieces of metal together to get the hang of the motor skills of welding before going into the design phase. 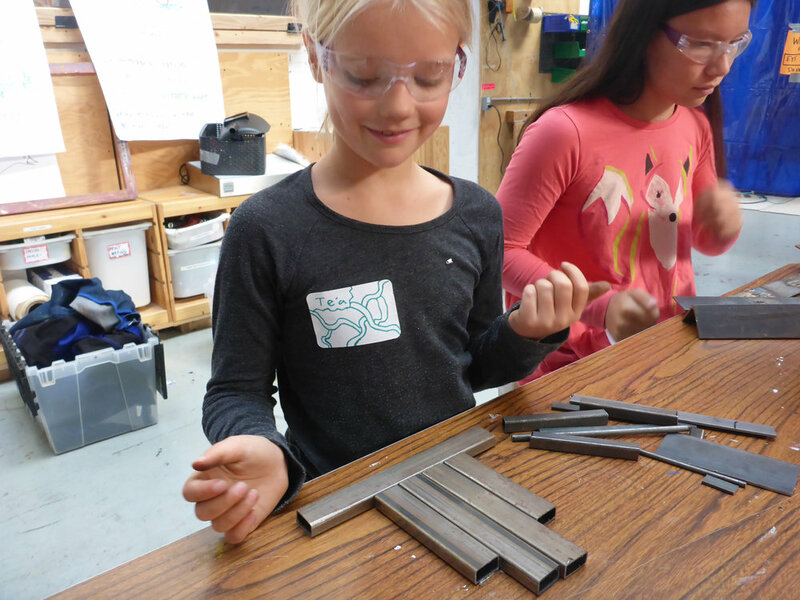 Tinkerers sifted through the available metal pieces and started drawing out their project ideas, while thinking about how to make them in 3D with the available pieces. They figure out their designs and get to work! 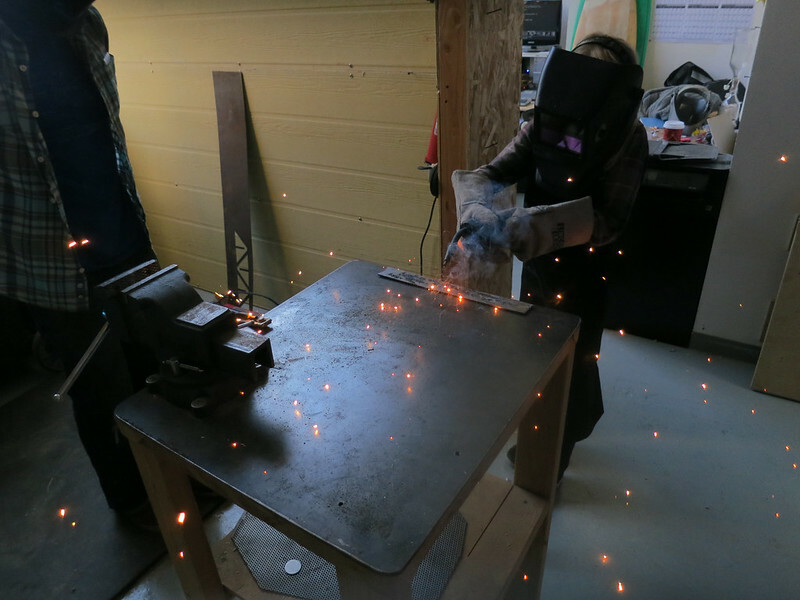 Only being able to weld two pieces at a time, tinkerers have to get creative with how they set up their pieces. Ideas begin to take shape, but sometimes the tinkerers have to be flexible about changing their ideas slightly to fit with the parameters of the materials. 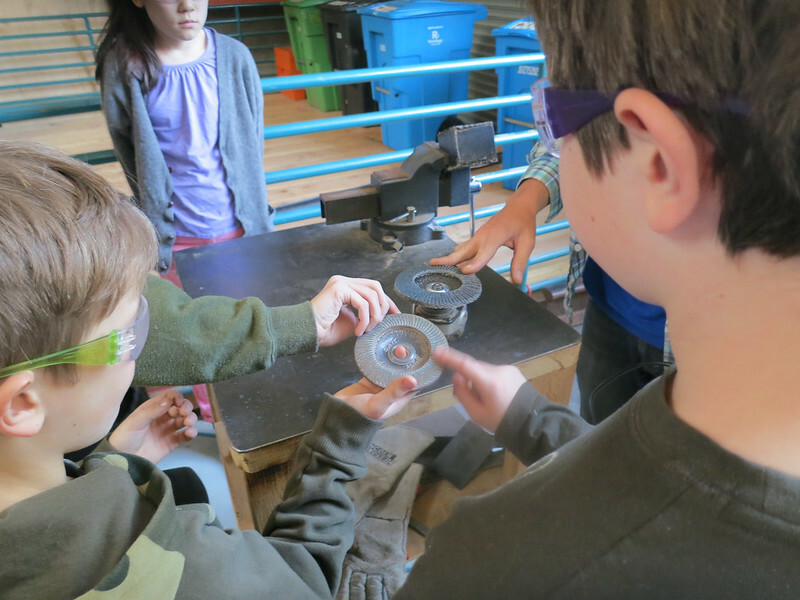 Collaborators were not cutting any custom metal pieces on the band saw today, so it was up to the tinkerers to figure out how to use the materials given to realize their designs. Sometimes the material constraints led to even cooler creations! A lot of the pieces that they could use were quite small, so tinkerers had to be very delicate with their welding. The projects began to take form! 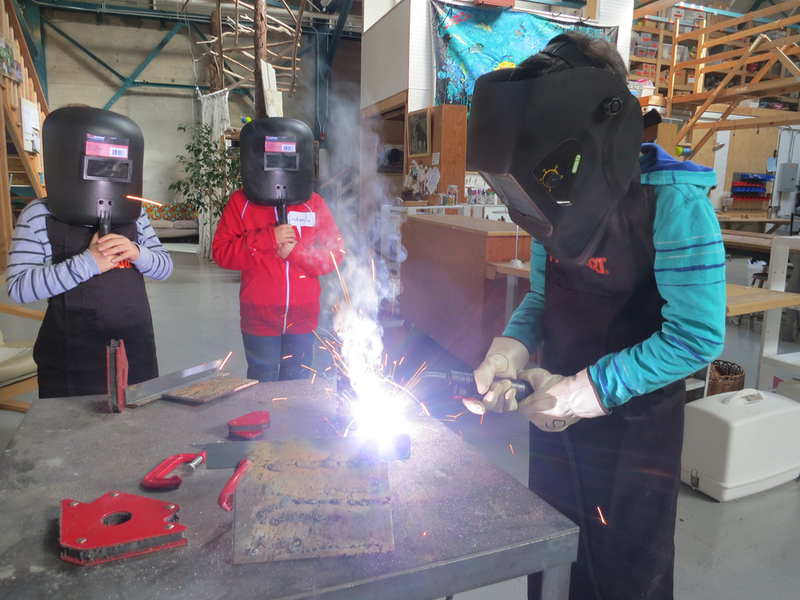 As tinkerers finished the welding portion, they realized that the welder could leave the metal discolored and lumpy. To make their pieces look shiny and finished, the tinkerers had at them with files, brushes and good old fashioned elbow grease to polish them up before the arrival of families. 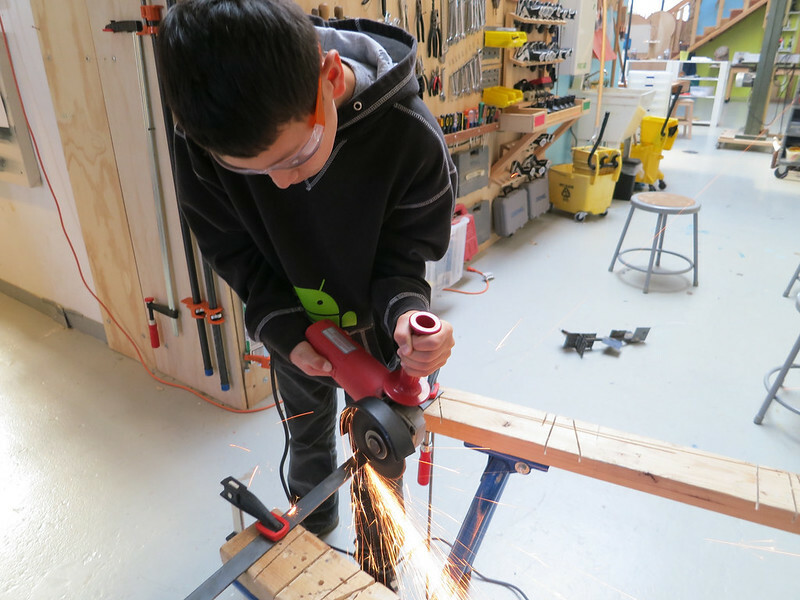 Finally, everyone gets a chance to share their projects with their family and the other tinkerers. Amazing! who would have thought at the beginning of the day that everyone would become such an accomplished welder in such a short time! Welcome to welding! the gang all arrives and we start going over the basics of welding. We like to start welding workshops off by sharing mistakes we've made recently to get ourselves into the mindset that everyone makes them and that's okay. Welding is super tricky and we let everyone know they are going to make a TON of mistakes all day long. 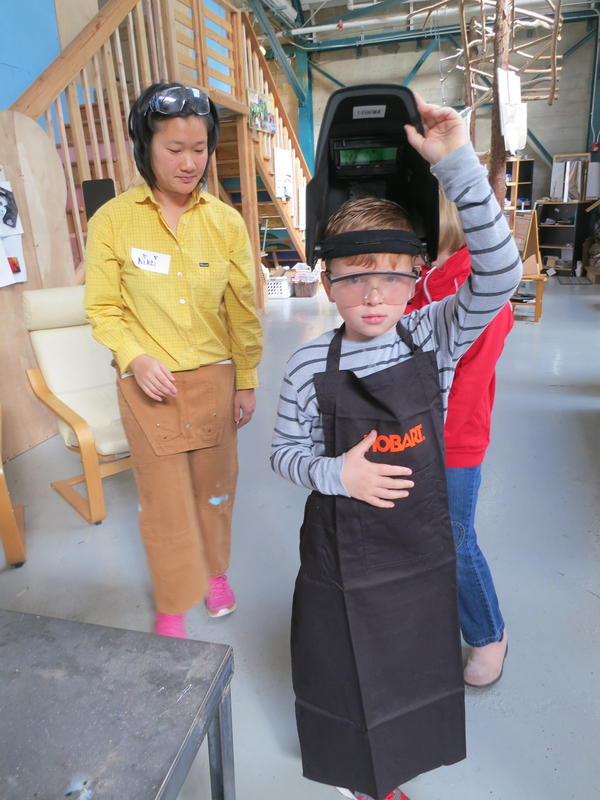 Then we talk safety and get everyone their first feel of welding! Collaborator Amanda shows us the ropes! 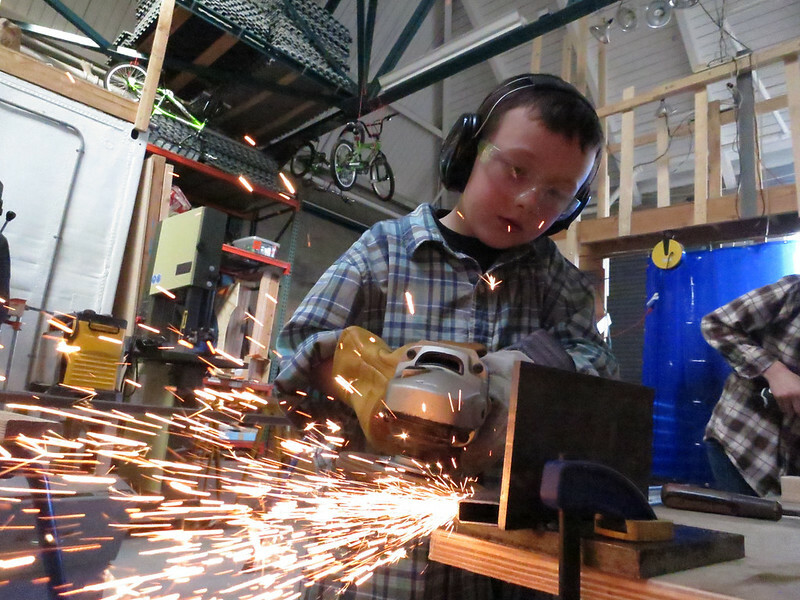 After learning about safety and techniques, everyone starts working on their projects! Jon finds the perfect pieces from the scrap pile! 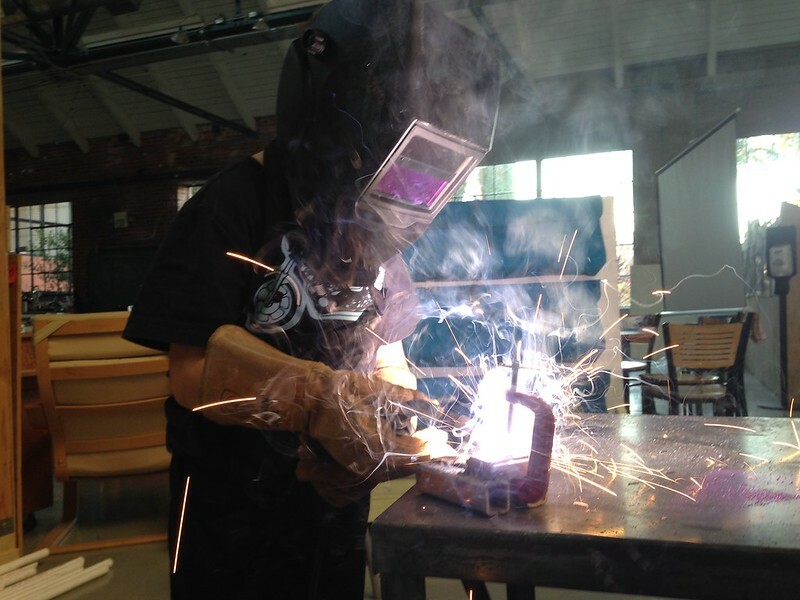 Once everyone gets a handle on their designs, they are eager to start welding! everyone rotates through the welding stations. After welding the metal pieces together there were some other fun tools that we used to finish up out items: files and grinders helped us polish our pieces and get rid of any extra weld. Paxton even used washers and nuts to put wheels on his car! The projects turned out great! by the end of the day, all the tinkerers were able to explain their projects to their parents (and even write on the mistake board!) It was awesome learning new skills doing something that seemed impossible a mere 5 hours ago! Welding workshops start off with a demo of what welding even is! Look at these pieces of metal melted together! We discuss what safety measures we all need to take and why. One of the most important rules is to assume that all metal is hot. Why? Because at some point today it was 3,800 degrees! Everyone feels the heat radiating from the freshly welded metal. Once everyone is suited up it's time to weld!!! Everyone gets a few practice passes to figure out how to control the welder's motions. We decided this weld was too fast because they weren't one continuous caterpillar, and the circles were too skinny. We all become welding detectives and check the welds to figure out if we need to go slower, make bigger circles, get the tip closer, or lots of other tricky adjustments! Then it's time to dig into our brains and the metal tubs and figure out what to create! Are you going to plan something? Or just starting welding things together? Some kids were practicing welding super tiny pieces together. 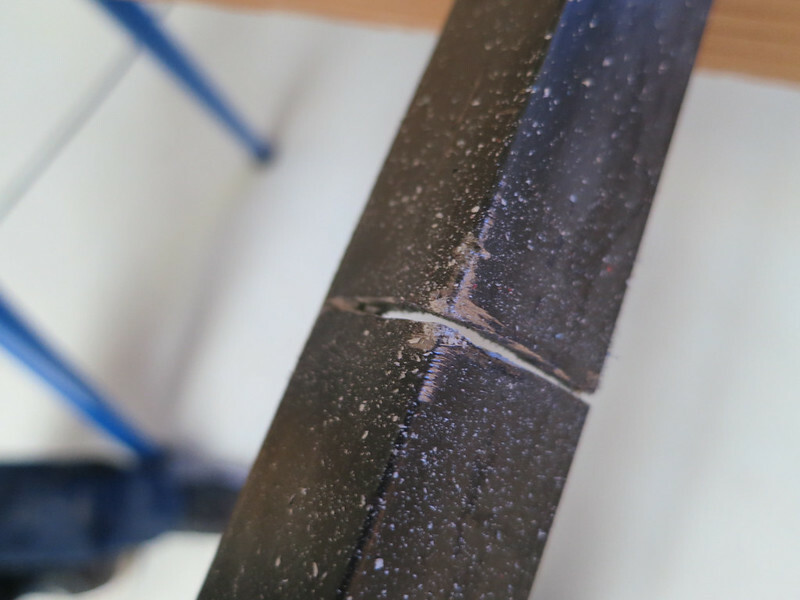 Some difficulties reported were: keeping the pieces in place before welding, not being able to see where you want to weld, and melting your tiny piece of metal. Over at the Experimentation Station, kids were making mistakes and getting really excited about it! Lucy accidentally melted through her super thin book end and loved it so much she decided to make the whole thing look like "crusty swiss cheese". The discovery of hole melting was explored by some other kids with thicker metal and they ended up with molten bubbles that looked like volcanos! As always, we got creative with clamping and connecting our projects into the welding circuit. 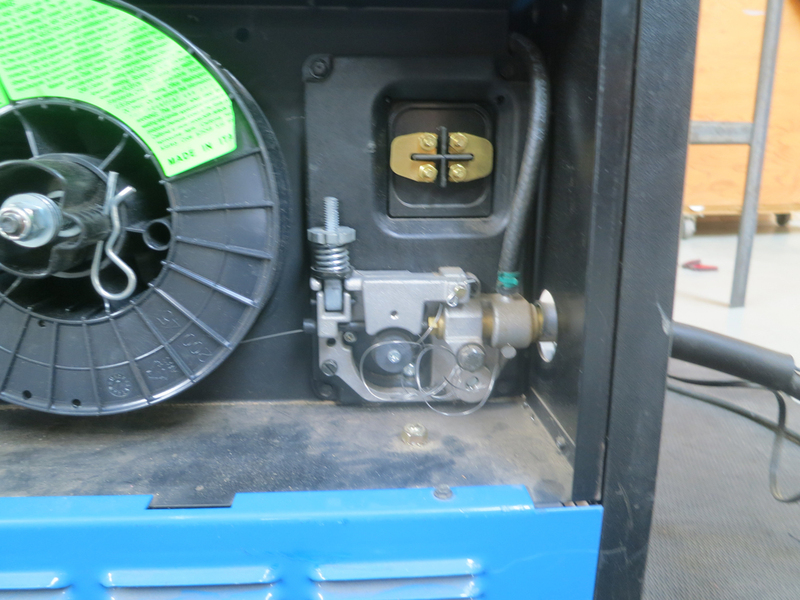 Aaaaaaaaaand as always we spent some time figuring out why the welder stopped working. Sometimes they just need some love and a new welding tip. Sometimes we get to open them up and untangle their insides! Check out all the mistakes we learned from and the sculptures, gifts and furniture we made today! Click here to see more epic welding photos from the workshop! Ewon, Axel and Amanda suit up! We like to start welding workshops off by sharing mistakes we've made recently to get ourselves into the mindset that everyone makes them and that's okay. Welding is super tricky and we let everyone know they are going to make a TON of mistakes all day long. 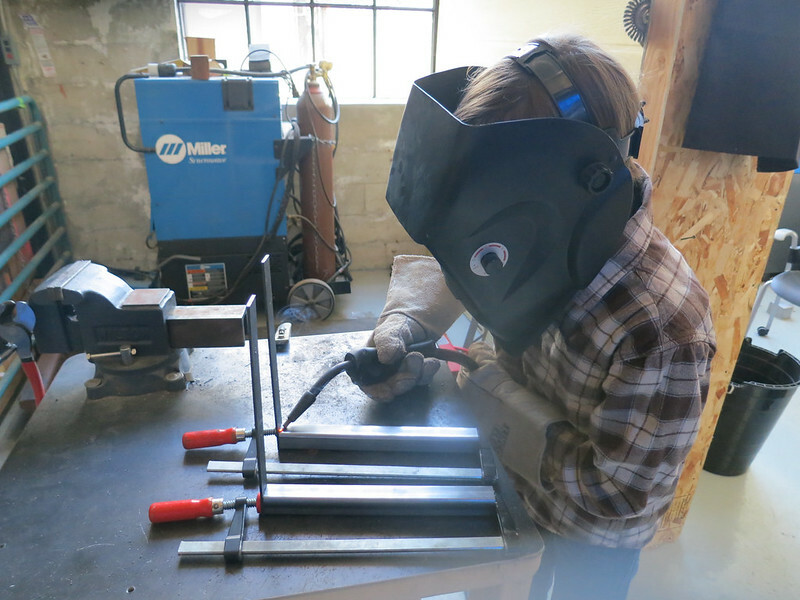 Axel practices his first welding beads! Once everyone understands what welding means and how they are going to do it - we go to the drawing board! Here the tinkerers can see what types of metal stock we have and can draw out their designs showing how they want to use it and how much they'll need! For some people figuring out what to make is the hardest thing they'll do all day. Jacob's design for a little robot from a video game he plays. When a design has formed and at least two pieces exist - we can go weld them together! Jay welds two sides of his box together! Another tricky part of welding is figuring out how to keep your pieces where you want them so that you can weld them together, plus they have to stay part of the electric circuit. We have magnets and clamps and creativity to help us out. Today everyone wanted to make tiny little detailed objects - something REALLY hard to do! In addition to figuring out the right pacing, distance, circle width and a bunch of other finicky details to weld we also accidentally welded our projects to the table super well and stuck our projects to the welding wire! Post welding there are some other fun tools we get to use: the angle grinder to quickly polish and shape your pieces, a file to slowly polish and shape, and Niki got out the wrenches to lock his wheels on the truck he made! By the end of the day everyone had created a project (or 3) they were excited to take home! 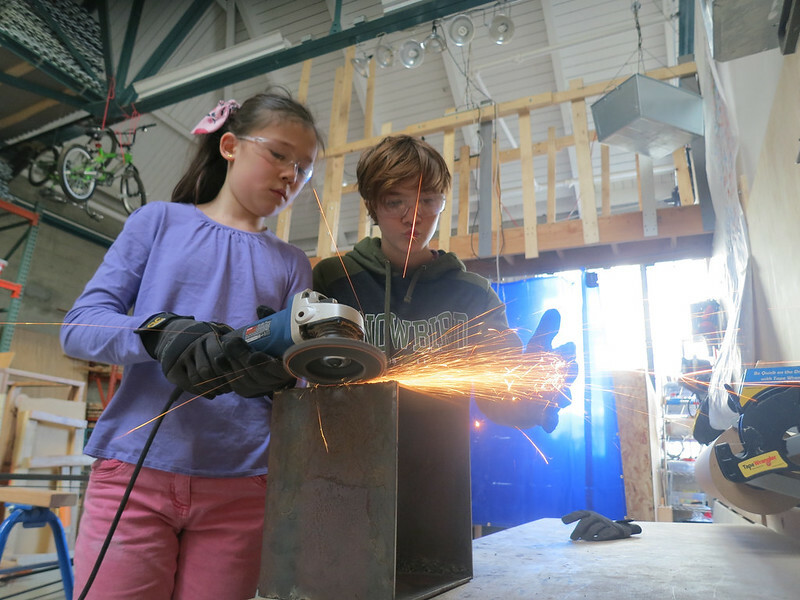 There were sparks flyin' at Tinkering School today...eight girls walked out of the building this afternoon with new skills under their belts. They're welders, now! The welding workshops are pretty different than the wood-based One-Day Workshops... because, well, metal is much different than wood. Also! 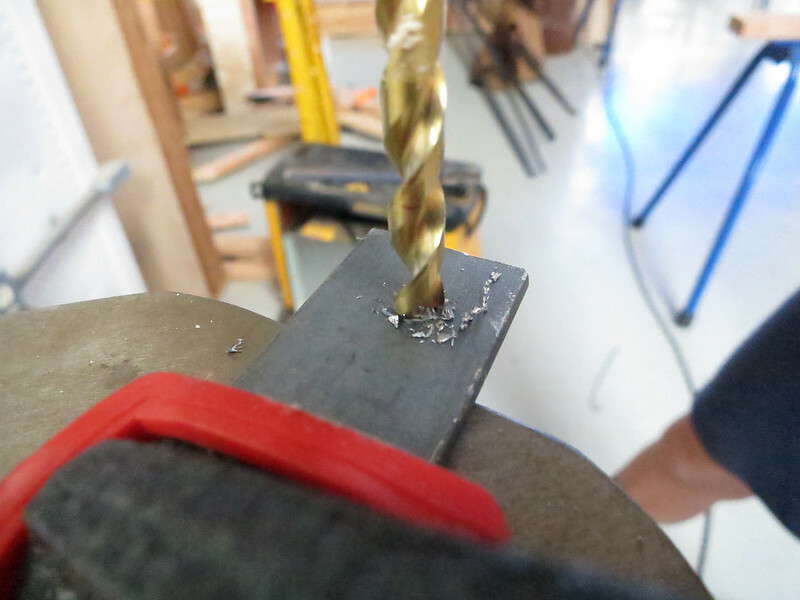 Unlike our more team-built wooden projects, welding is really hard to play as a team sport. And! Even though these are solo jams, we gotta share the equipment. We have 3 welders to share. This means a lot of the day's learning is based on watching other people try really, really hard. 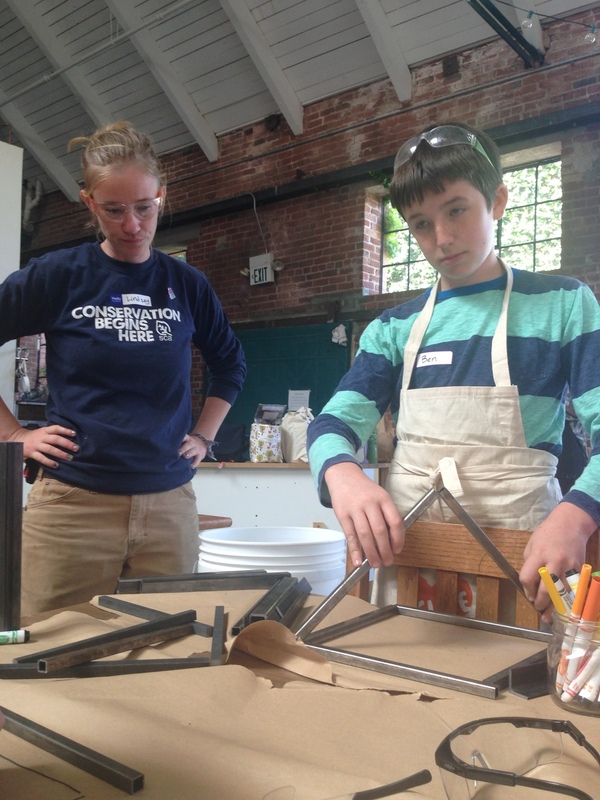 By the end of the day, everyone had transformed a pile of steel scraps into a unique project of their own design. Many of the welders used the drill press to drill holes into their work, and most of them used the grinder to smooth edges, cut off small pieces of steel, and correct mistakes. Oh, and everyone made loads of mistakes! We even had a chance at the end of the afternoon to share our favorite mistakes of the day. 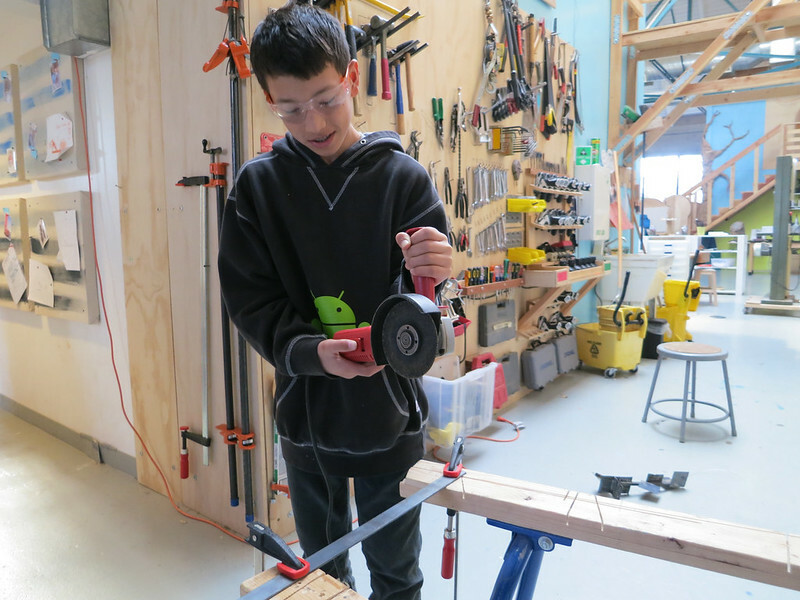 This unique opportunity to normalize failure as a crucial part of the learning process is one of the things we value most at Tinkering School. We should always remember to pull our hoods down before starting to weld and drape the welder over the table when we're done, so as to not accidentally pull the trigger! Sometimes you might weld your steel pieces into the wrong place. It's okay to start over. Mistakes are normal and useful and great. You can check out even more awesome photos from the day by checking out our Flickr album. The Welding Workshops are by far my favorite. 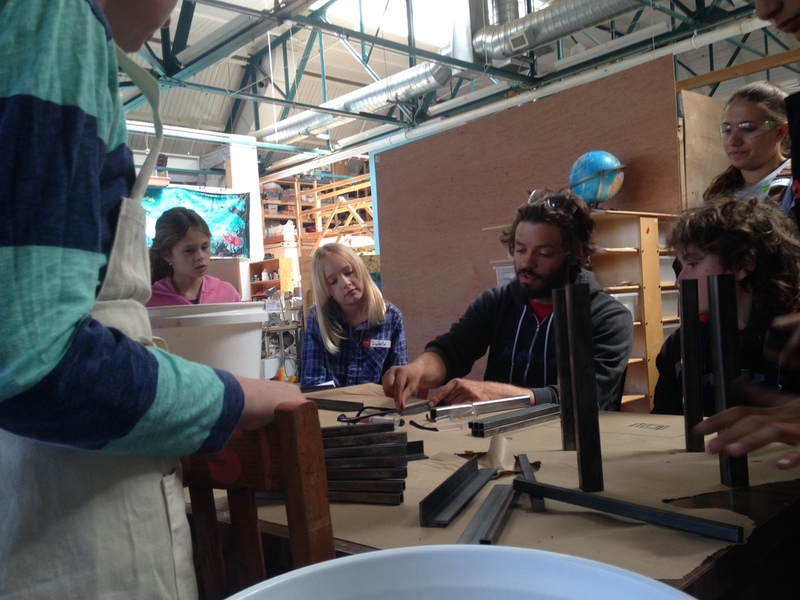 They are much different than the wood-based One-Day Workshops... because, well, metal is much different than wood. Also! 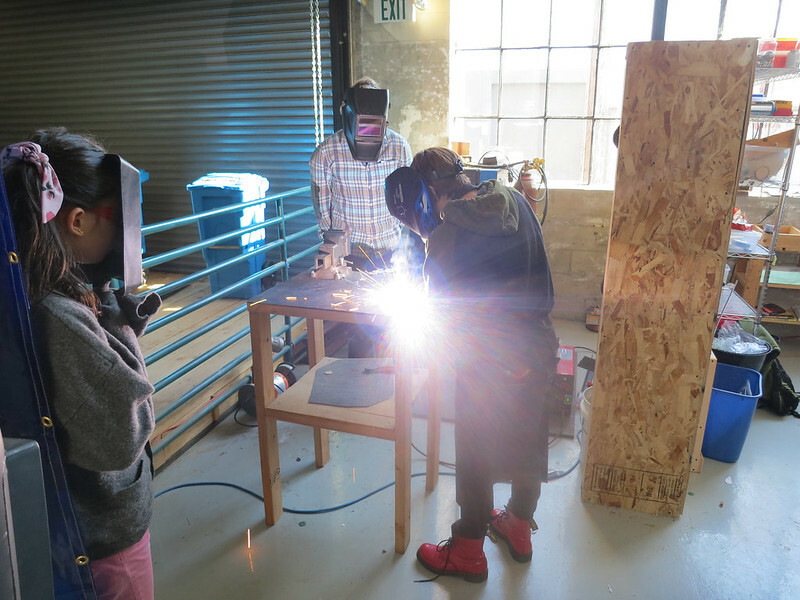 Unlike our more team-built wooden projects, welding is really hard to play as a team sport. 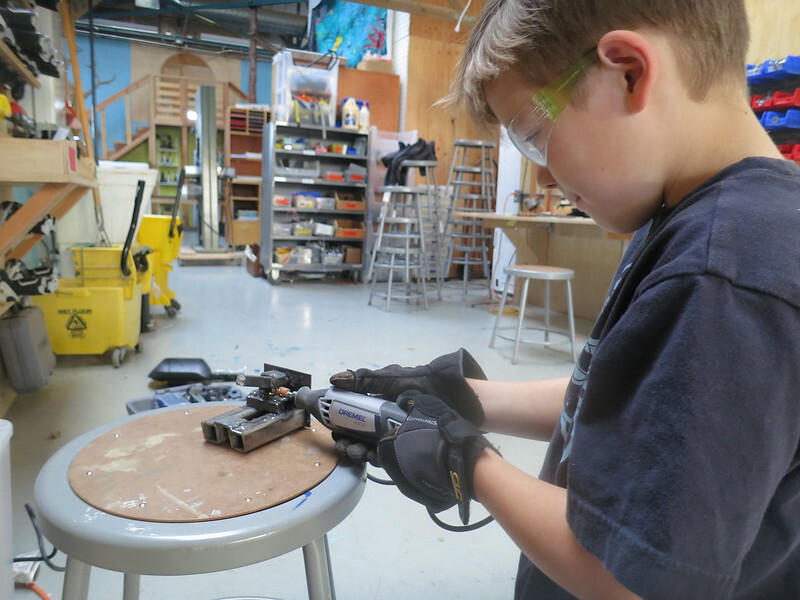 We have to translate our Tinkering School goals (building something bigger than yourself, learning from failure, collaborating and making friends, and trying harder than usual) into a curriculum where solo technical skills are being practiced. These constants are challenges, and they make the workshops interesting for both the Collaborators and the Tinkerers. Challenging, interesting -- but so fun and fulfilling. Watching someone who's never welded before lay down their first bead of metal. Telling the welder that they messed up, and then asking them to figure out why. Explaining that this is a process about practicing how to hold your body and not about making things. Helping kids use really strong magnets when everything around the magnets is steel. Brushing off a fresh weld and watching it change color. Seeing all the cool stuff (that I would never think to make!) get made in such a short period of time. Witnessing how excited everyone always is at the end of the day. This is a really tough skill to do well, and again today, everyone rocked it! Check out all the photos from the day by browsing our Flickr Album! 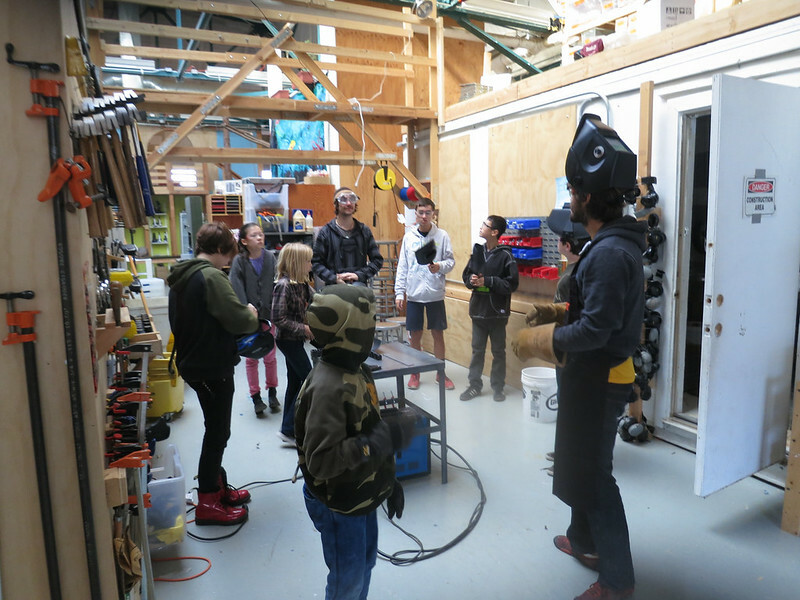 The first workshop I ever helped at here at the Tinkering School was a welding workshop, so they hold a special place in my heart. Sparks fly, kids are on the edge of their seats, ears perked, super interested in what exactly is happening when that special yellow-green light is glowing. 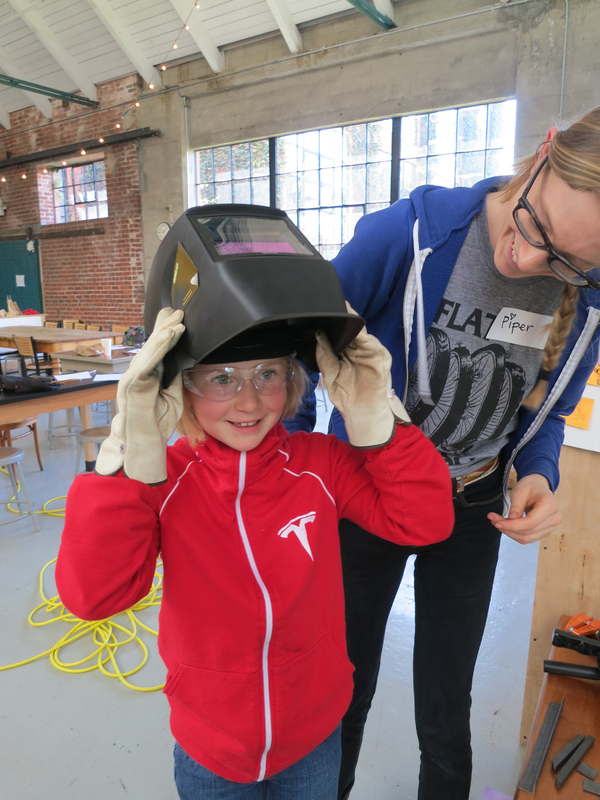 All Girls Welding Workshops are extra special, because I think they get really close to so many of our goals: nix the jargon, learn a technical skill, and practice so many social emotional skills along the way. Lulu (and Ava!) with her giraffe and tree sculpture. 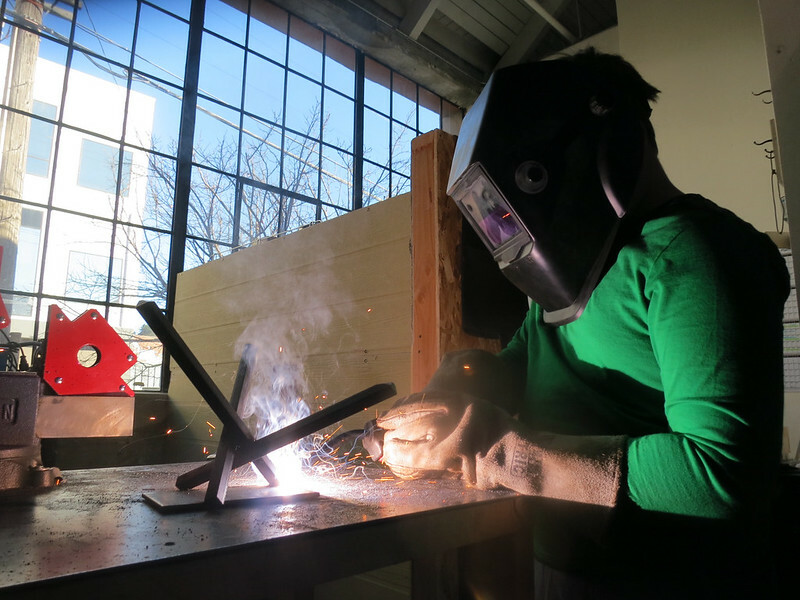 Lulu is a welding regular; she started this sculpture at her last workshop a few weeks ago, and brought the head back today to finish making the body. We started the day with a quick safety overview: heat, UV rays, and electricity. Assume all metal you see is hot today! Give it a quick wave with your hand before touching it. Wear your safety glasses all day! Even at lunch, because UV rays are invisible. While there is a whole lot of electricity moving from one end of this circuit to the other, it's actually pretty hard to get yourself into the circuit. Everybody, make sure to stay dry during this welding workshop, and we should be good. Also, ask your kiddo about the amperage:cars, voltage:road talk. It's one of my favorites to give! Then, we got started with the real meat of the day: trying welding (some for the first time! ), designing a project and getting to work! 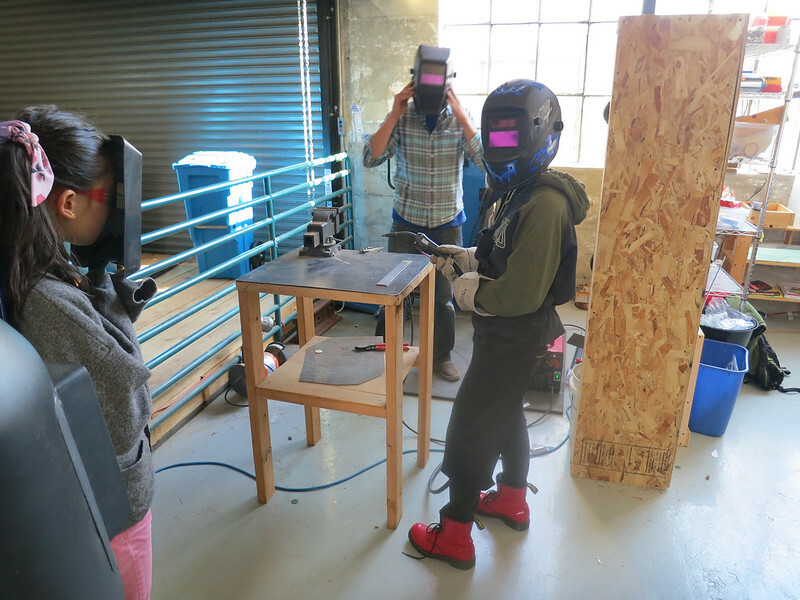 Abby, Marisol, Audrey and Amanda get ready for their first times welding. 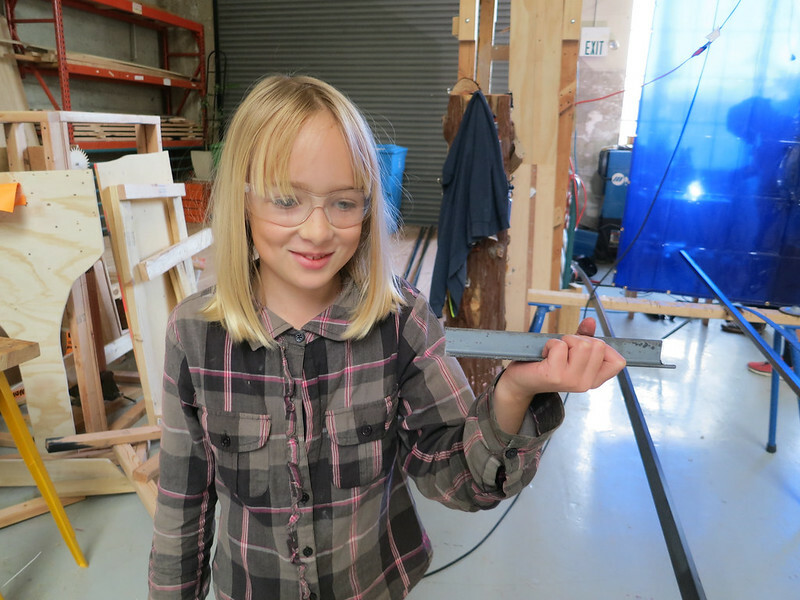 Sophie measures some pieces of 1/2" square tube to see if they will work for her table. Today was so awesome for this reason: everyone got so much welding done! With 3 welding stations, 9 kiddos was a great number. One welding, 2 on deck. While on deck, kiddos needed to figure out how to setup their work in order to be ready go when their turn arrived. We explained at the beginning of the day that about 90% of welding is just getting your work and your body setup and ready to weld. This means using magnets, clamps, other pieces of metal to, whenever possible, weld in the direction of gravity (flat position) and thinking about where you will rest your non-dominant arm to stabilize your had that is holding the welding gun. These kiddos really took this to heart, and thought through their setup instead of grabbing for the trigger. While this takes a bit of time, it meant we could move through turns really efficiently, which meant kids got lots of time on the welder. Yay! Addy and Evan working on her pencil box. Audrey working on her box; it may or may not help her get her room organized. Then, at the end of the day, everyone did an amazing job helping us clean up. A few even helped us grind the tables clean to be ready for our next welding workshop! Today was the best. What can I say, we really really did it today! Check out more pictures from today on our Flickr! We love our welding workshops SO much. 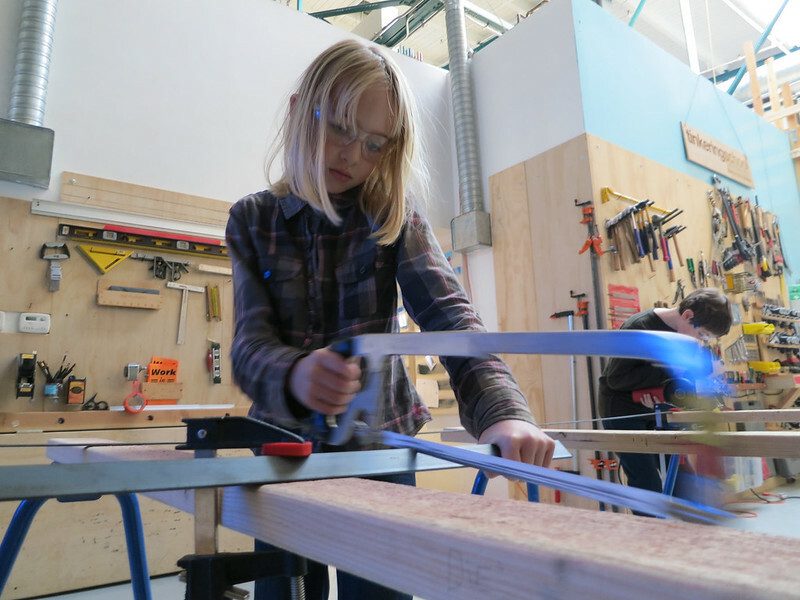 Kids get their hands on tools and materials that they might not ever use otherwise, and develop an understanding and appreciation for the built world around them. Amanda goes over some basics of how the welders work. 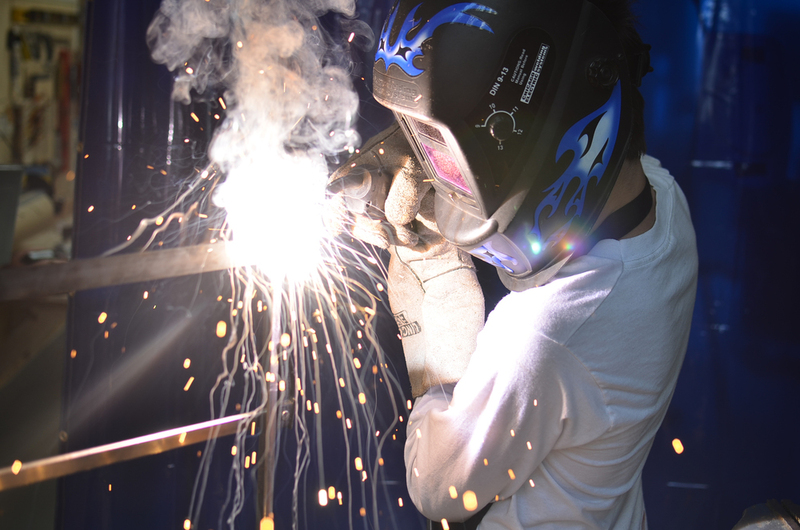 We practice flux-cored arc welding at our welding workshops. This process works well for us because its versatile enough, and we don't have to worry about cylinders or gas shielding. We start the day with a quick check-in and introduction--this time sharing a story of a time each of us made a mistake. Because guess what: today we're basically going to spend the whole day making mistakes! This skill-based workshop is so different from our other programming. It allows us to really focus on goal number 3, "Learn from mistakes and failures." Then we talked about our main safety concerns for the day: heat, UV rays, and electricity. Then, we got started welding, duh! David's first weld with Piper! After taking a stab at some of their first welds (or brushing up on skills for returning welders! 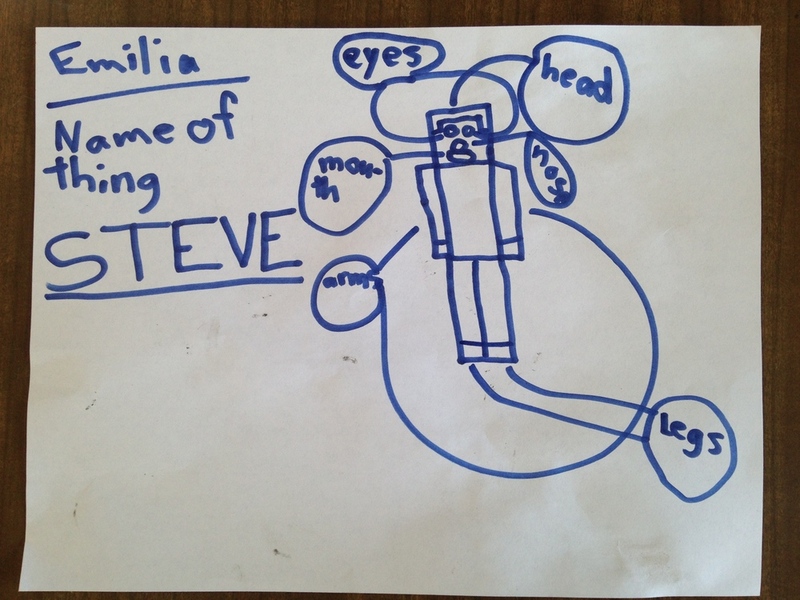 ), kiddos spent some time thinking about what they'd like to make. Another thing that makes welding workshops different is that each attendee works on an individual project that they get to take home at the end of the day. Yay! Lulu carefully stabilizes her body with one elbow resting on the welding table so that she can make a longer weld. Lily's design for a chandelier involved drilling holes so that the 'gems' hanging from her chandelier could be attached with cord and dangle nicely. 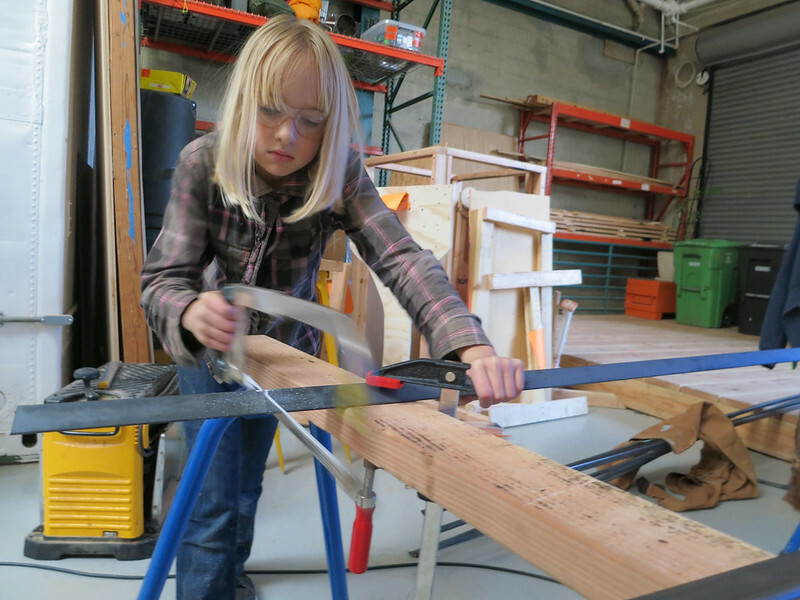 She learned how to change the speed on the drill press too! Anastasia shows off the dragon she made! At first, she thought this project might be a little too big, but with a boost of confidence from some collaborators, and some outside the box thinking about the design, she really made it happen. We can't wait for her to come back to attach the wings! Check out our flickr for more pictures from the day! One girl even said that we should call this Fashion Workshop instead of Welding Workshop, because of the fabulous gear and grime smudges we were all wearing. Welding workshops are a little different than our regular workshops, they are ALL about mistakes. That's basically what we do the whole day, is mess up over and over again. These kids were excited and afraid and went for it! They asked for help when they needed it and worked on their own when they could. Everybody really focused and got lots of time at the welders. At the end of the day we had some unique picture frames, platforms, shelves, and presents for little brothers! 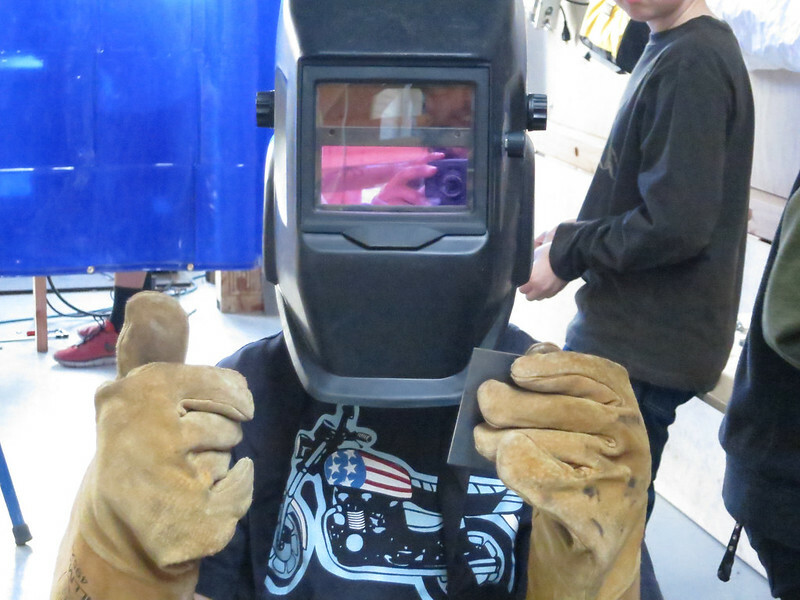 This Intro to Welding class we got up close and personal with the welder right off the bat. After everyone got the feel of the welding gun with Diana each person dug around in the scrap bin and started welding things together! We had some really fun, round scrap pieces to inspire the class and give us some hurdles to work around. Round things only touch flat things in one little spot and are super tricky to clamp, so we got really creative at positioning and also learned how to spot weld. 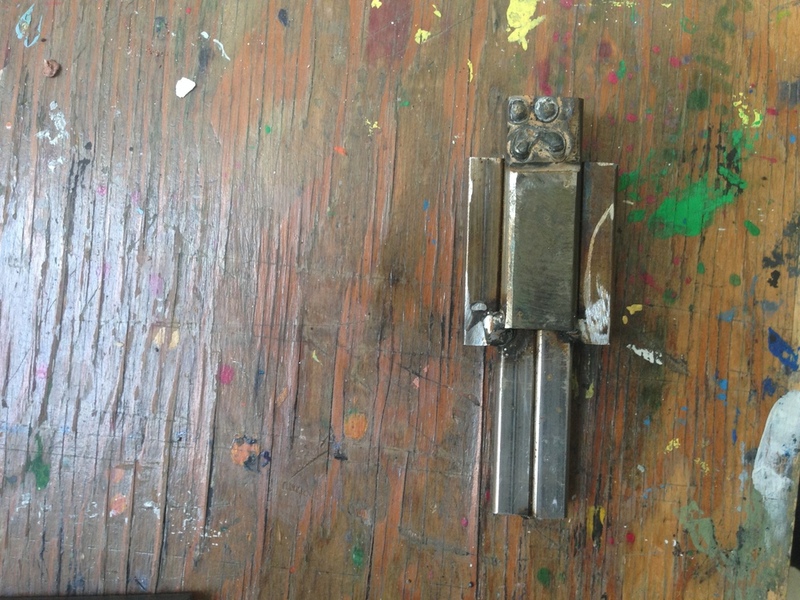 These pieces were also really rusty. We discovered that the rust makes it really hard to make an arc and this group of tinkerers were amazingly patient; either scrubbing the rust off of their pieces or welding really slowly and attentively. A lot of really interesting creations evolved out of some welders' practice pieces. Other people had a clear vision of what they wanted to make when they arrived and they got straight into planning how to make their vision a reality. 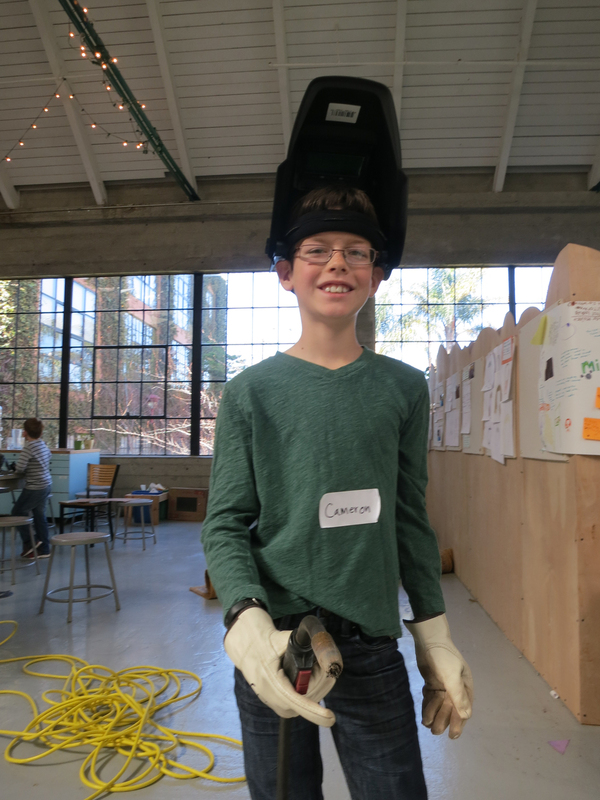 At the end of the day a group of grinning tinkerers shared their creations and a tricky situation they struggled with while learning to weld. What a satisfying day! 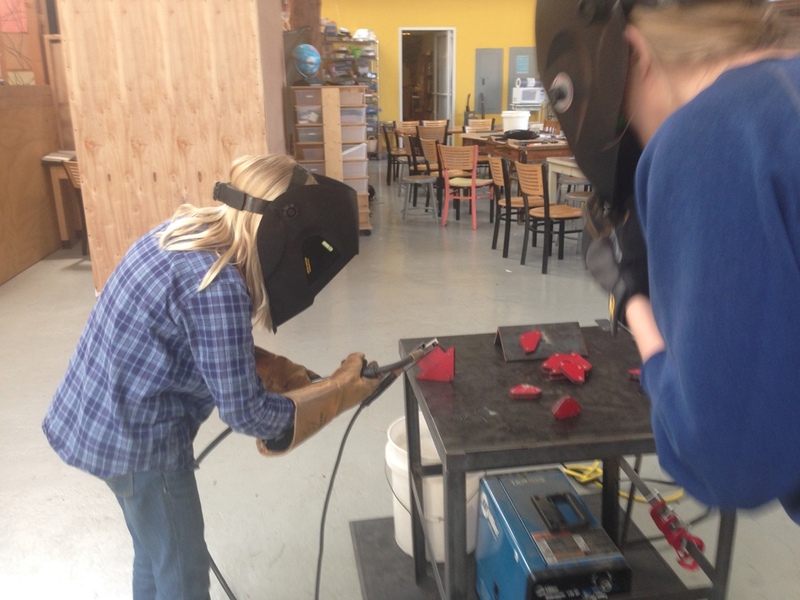 We recently had a day for young women to come try their hands at welding! 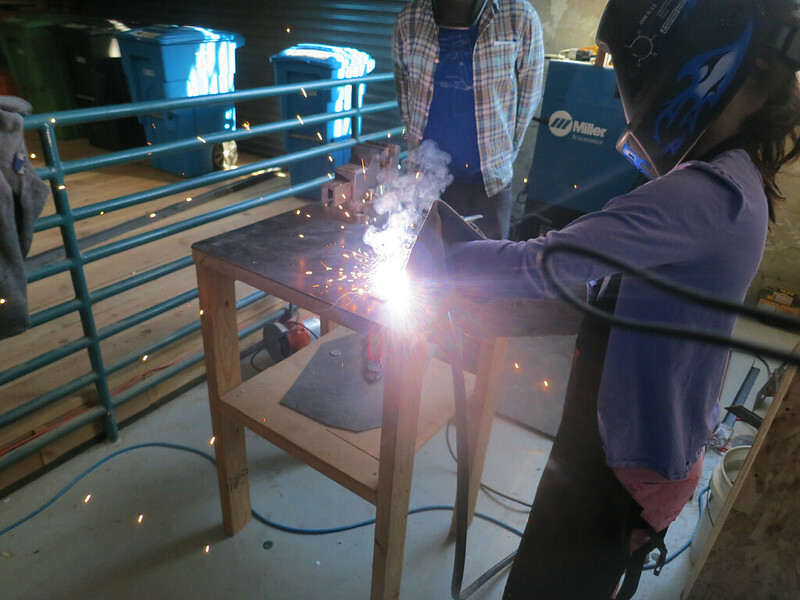 Our Intro to Welding class is a great way to get a feel for using a welder and get comfortable making sparks and heating up metal! We start off talking about what dangers we might encounter while welding and how to counteract them so that everyone stays safe. Then we all don the safety gear and get to it! But wait! 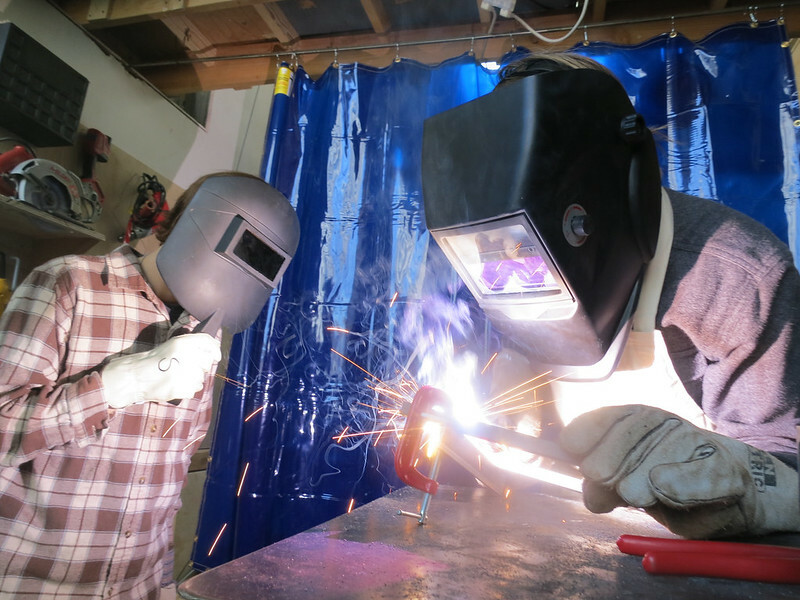 Before we can make sparks fly we have to figure out how to keep our pieces in position, how to hold on to the welding gun with giant gloves on, and where to put ourselves so we can weld as well as possible! Whoa! So much to think about at once! The girls weld scraps together all morning, checking each bead to see if they need to move slower or change their hand motions. Pretty soon it's time for snacks and design time! After the plans were laid, all manner of measuring and cutting began. This group all had very unique projects and they had to custom cut almost everything! These tinkerers showed a lot of perseverance and patience while learning how to use the welders and they all left with impressive creations. It's always exciting to see each Tinkerer bring their designs to life and see in their faces how proud they are of their accomplishments. This Sunday was our first Intro to Welding of the year. This was an awesome session, with all of our young welders showing lots of thoughtfulness towards one another and their work. Projects ran the gamut from sculptures (like Oscar's MineCraft tiki mask) to furniture (like Ishwari's stool). 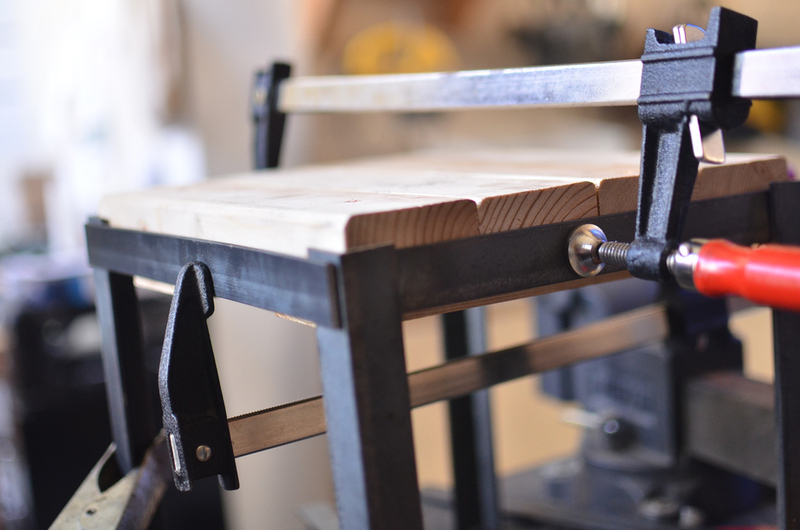 We got to break out lots of the big, charismatic tools, like the grinders and the portable metal bandsaw. Today was an amazing day of welding and working with kids. The projects ranged from functional to useless. From playful to on the edge of high art. The kids were focused, persistent and kind. It was the best kind of day. We keep our intro short. Kids aren't here to listen to adults talk. They are here to make stuff. A little speech on how cool welding is (seriously, 4,800 degrees is a neat amount of degrees), a reasonable amount of time describing all the ways you can get injured (sun burn on the skin or cornea of the eye, electrocution, burning skin by touching hot material, burning cloths from flying embers, ect), and some time on mitigating these dangers (face masks, long sleeve shirts, fire resistant aprons, procedural calls, ect) and we were off. The first step is always exploring the tools. From there we play with the materials. We like to call this sketching, but don't get the wrong impression. Sketching is not inherently a pen and paper exercise. For us is it the roughest prototype and an externalization of ideas to increase our understanding of what we are trying, and make communicating our ideas to others easier. From there, we just make. We make and we make and we make. Cutting, welding, grinding. Designing, trying ideas and reshaping our ideas to fit what's possible. It's world that mixes new possibilities with real and sometimes frustrating constraints. This group faced each and everyone of those constraints with flexibility and enthusiasm. One particularly excellent moment in the day was when one of the welders jammed. With incredible disappointment in their tone, one child asked "Does this mean we just go home now?". It was one of our most delightful learning moments to be able to say "No, we don't go home, we fix the broken machine." It was a chance for one of our collaborators to model the problem solving and persistence required in real project management and execution. What ever is stopping you from solving your problem is your new problem now. So we fixed it and kept welding. The 8 kids who came to Intro to Welding today where focused and ready to dive in. They used a little over 90 volts and 20 amps to bring steel to over 4,800 degrees fusing it into solid single pieces. Many of them even wandered into the world of mixed material crafting by adding wood and cardboard and plastic to the mix. Today we made chairs, tables, flying busses, coat-hangers, rectilinear art, abstract art and more. 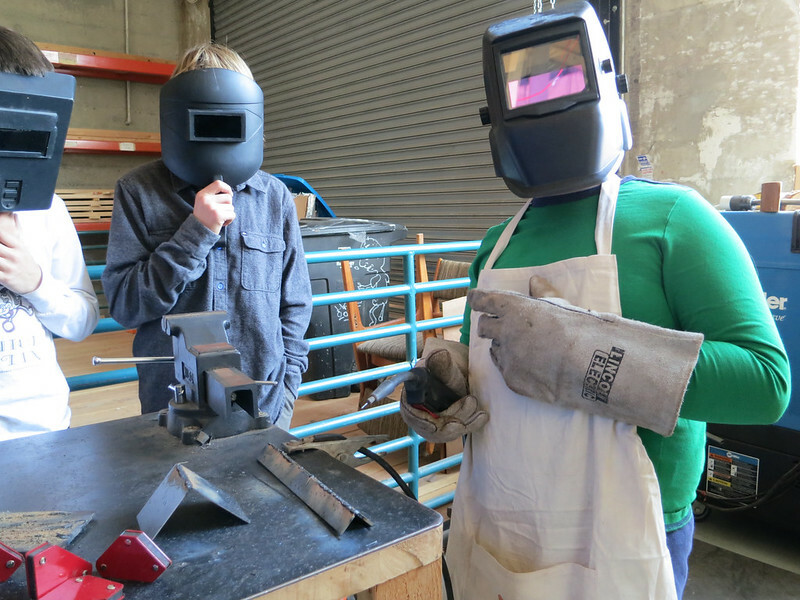 Intro to welding is quickly becoming one of our most fun and popular workshops. Wielding 90-120 volts and hundreds of amps to bring steal to over 4,000 degrees to melt steal into liquid and let it freeze into a shape of our choosing is something that may never get old. The day starts with safety training and skill building. We start with making straight lines of bead and move into binding corners. Using a base set of pieces we ask the kids to get creative within constraints. However if their imagination takes them towards needing longer or shorter piece we have our trusty new portable band saw on hand to make the cuts. The projects ranges from flower holders and wall mounted night stands to miniature chairs and abstract art. Todays crew epitomized pertinence, awareness of others, and courtesy. "Do you need help clamping that?" and "He can go first, his welds are easier and faster than mine" were heard again and again all day. 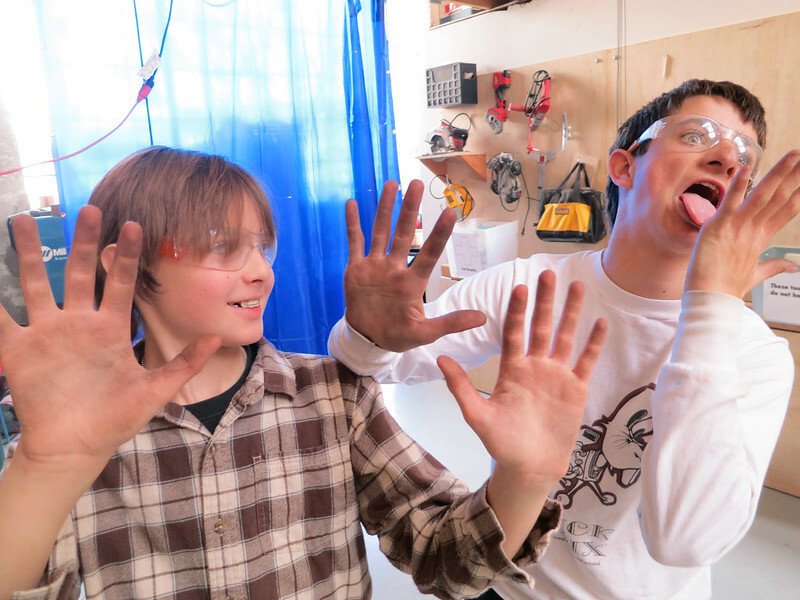 There is a deep need to clean our hands after working with metal dust and grease. Once the welds set, its time for grinding. 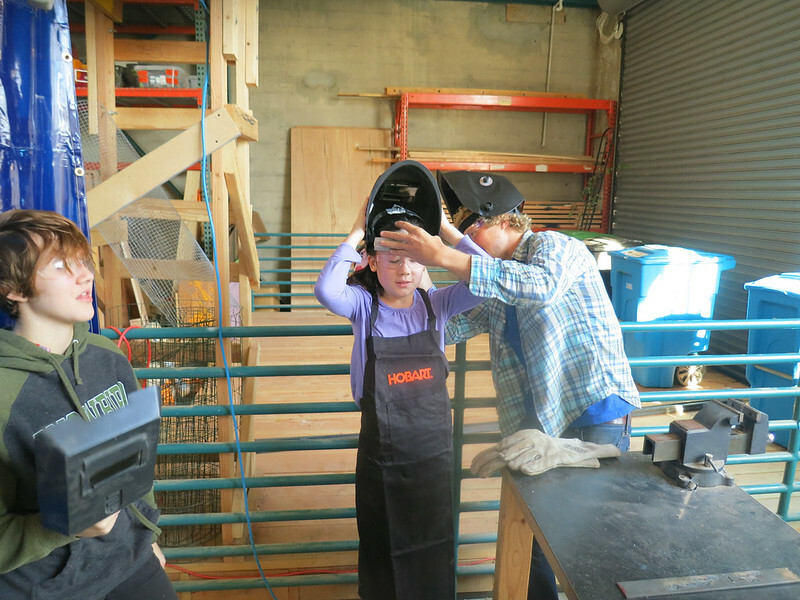 The kids really get into smoothing out and polishing their welds, giving their pieces a shine to be proud of. 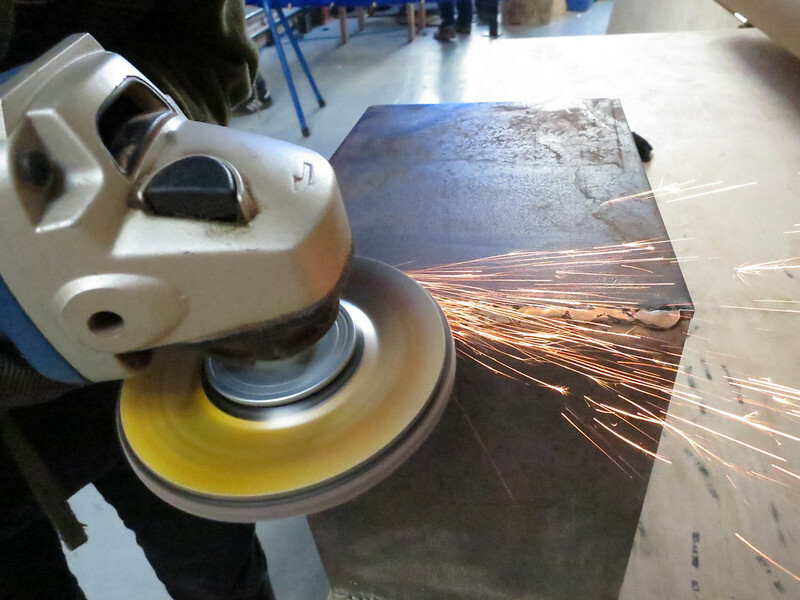 Also, the angle grinder is really cool to use. We have magnetic corners that really make nailing the corners a whole lot easier and more fun. Be sure to check out even more photos from the day. 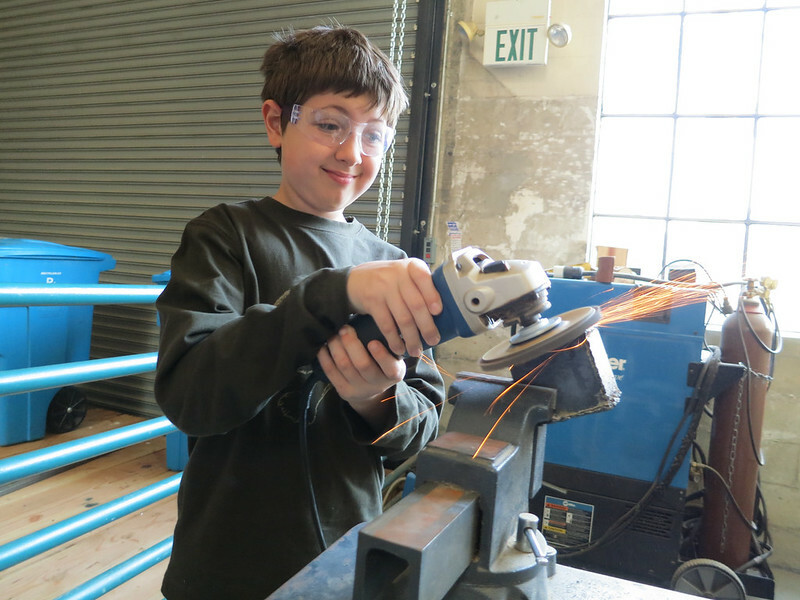 With a few hundred feet woth for flat iron, angle iron, and square tube steel, two welders and 8 kids we set out on an entirely new journey for Tinkering School San Francisco. We welded. Its important to note what welding is and isn't. It is not the steel equivalent of hot glue. Most things you have built or have seen built are multiple objects, that even when bound together stay multiple distinct objects. 2 pieces of steel that are welded become one piece of steel. Welding uses enough electricity to take two pieces of solid steel, melt them into liquid steel, and reform them, at the atomic level, into one single contiguous piece of steel. It's awesome, in the purest sense of the word. Then it's right to straight line practice. We don't start even trying to weld until we can bead a decent straight line. 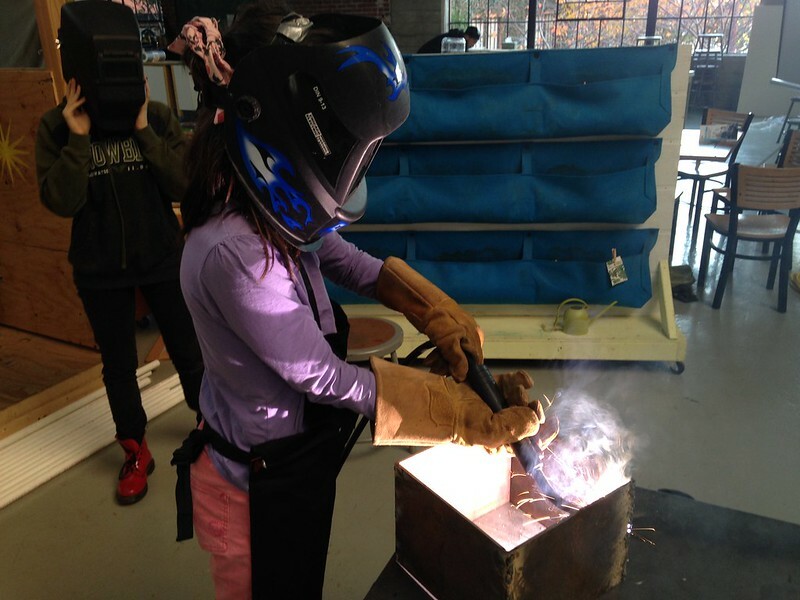 Sparks fly as Isabella tries welding for the first time. We didn't stop at welding. 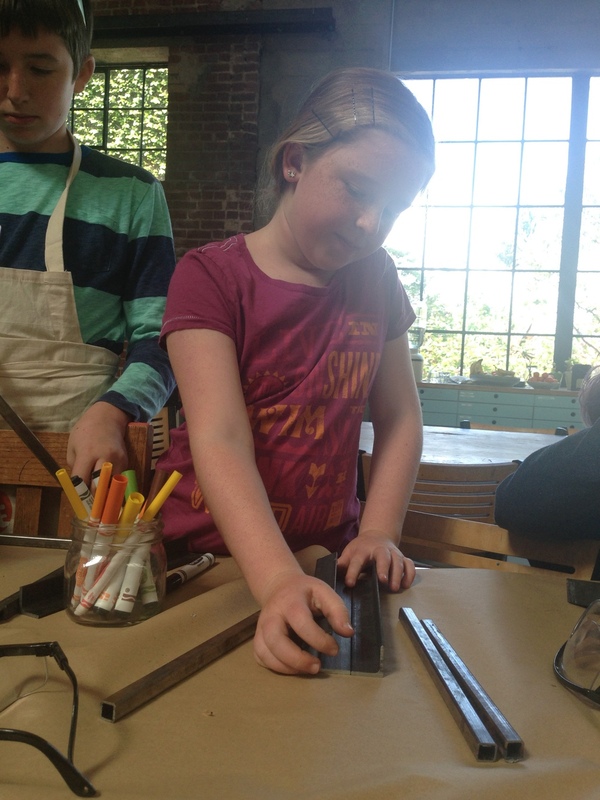 We also explored cutting metal and grinding metal. The basic essentials of metal work. 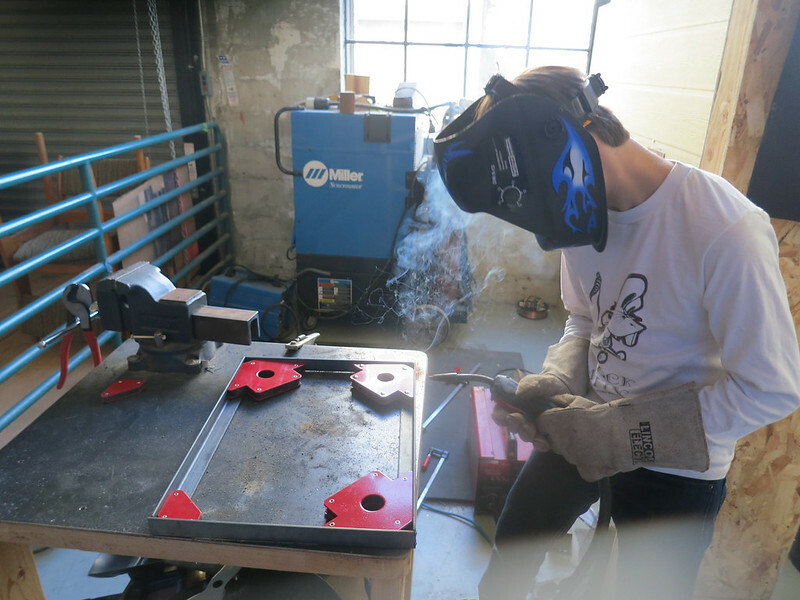 Frannie welds two angle irons together. Isabella hacks through a steel bar with raw muscle power. Ben takes another route with the angle grinder. 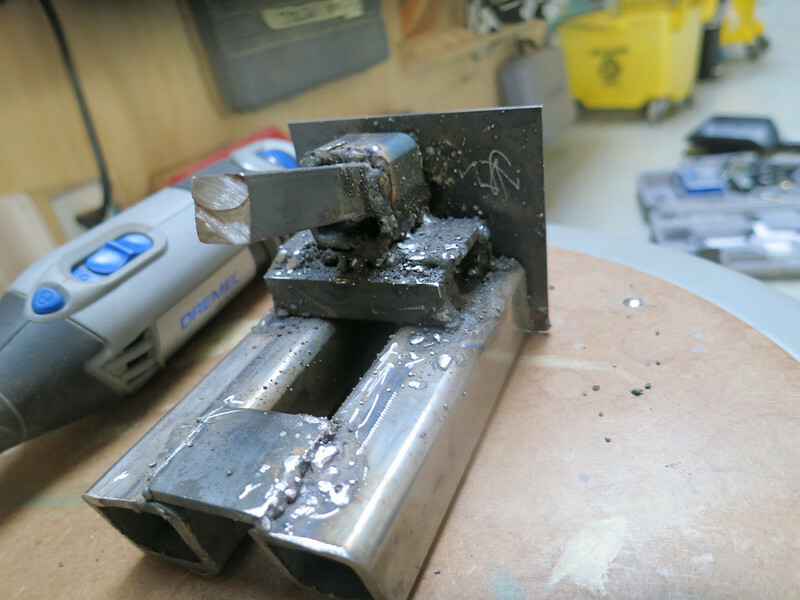 The cut isn't as clean, and the metal is scolding hot afterwards, but it is much faster. 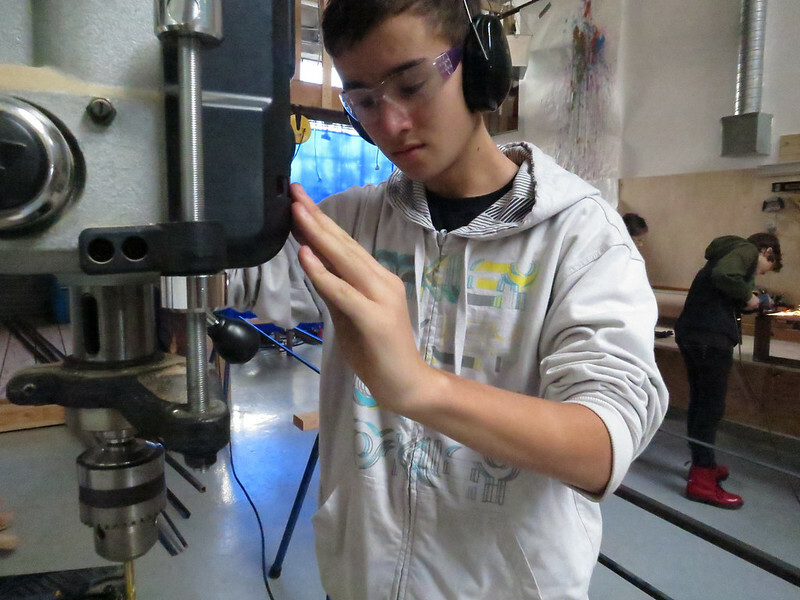 We even got to use the drill press as Alex crafts a coat hanger. Alix and Frannie made a startlingly square box, with edges as smooth as anything we've seen made by adults. Their commitment to excellence and focus on execution was unparalleled today. Kyler is stoked on the tiny sculpture of a tank he is working on. 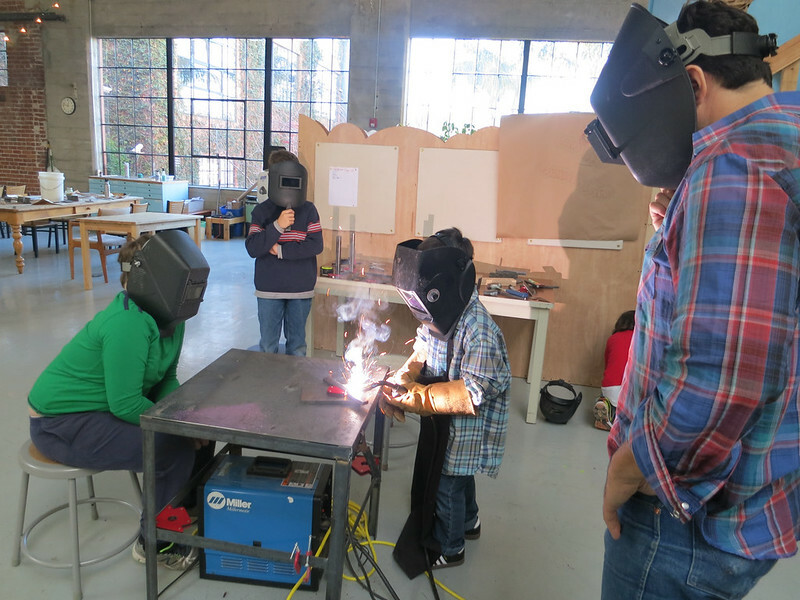 We are delighted to introduce welding to our repertoire here at Tinkering School and cannot wait to see what the kids make next.